This is a masterpiece that we’ve all been waiting for. Unfortunately only a few of the richest will ever have the chance to experience this wonderful creation in on of the most expensive luxury cars . The tech surrounding this unit is just pure genius ! Best of all it’s not just a full stack of mouth watering tech, it simply works ! The engine came at the late 2015, early 2016 and all though it propels the Dubai’s prime, the mighty Devel Sixteen ( one of the best 2016 luxury cars ) from 0-60 in just 1.8 seconds and a top speed that pushes the bar for all sports cars out there to 350mph, there is still a lot of negativity and skepticism around it. The main criticism to this engine is that this is just two of the GM LS V8S joined at the crank. However this wonderful masterpiece is much more than that. Yes there are a few steps that were dictated by the LS development because it’s easier to build on top of something you know, but things ran on their own path. Unlike the LS, here Steve Morris (lead engineer) has to overcome a huge problem. He had to figure out how to make sure that firing two cylinders on the same side in a sequence or two cylinders at once would not happen, if so, the engine would grenade itself. This was done by an entirely new design for a V16 crankshaft and a novel 45- degree firing order. The block of the engine was born out of a 48-inch-long billet. The push-rod shares some dimensions with the GM engines but it’s not a full copy of it. There is a gap between the middle of the two cylinders that allows for a thrust bearing on the crank, a feature that was taken from the Ford small-block design, this disperses the load a bit better than the LS. The main bearing caps are all put into one big-piece girdle that gives the crank some extra stability. 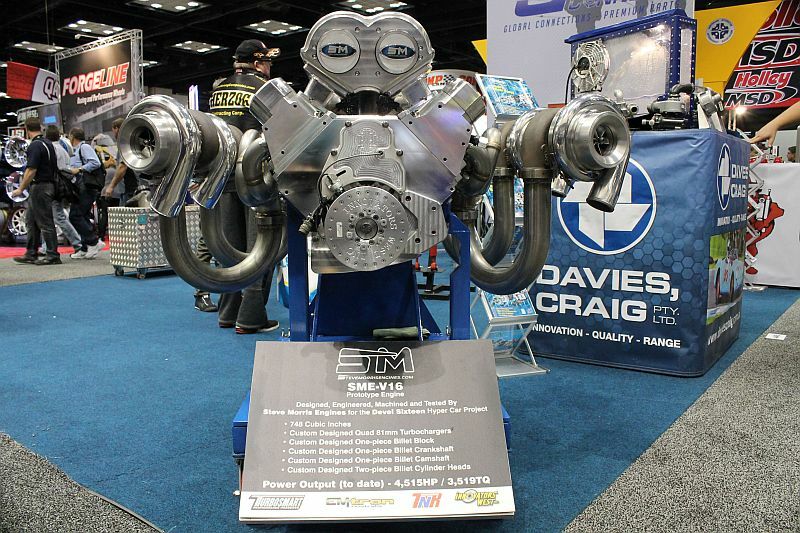 The turbos itself create around three pounds of boost ! The engine makes the scary 1050 lb-ft of torque at just 3000 RPM. 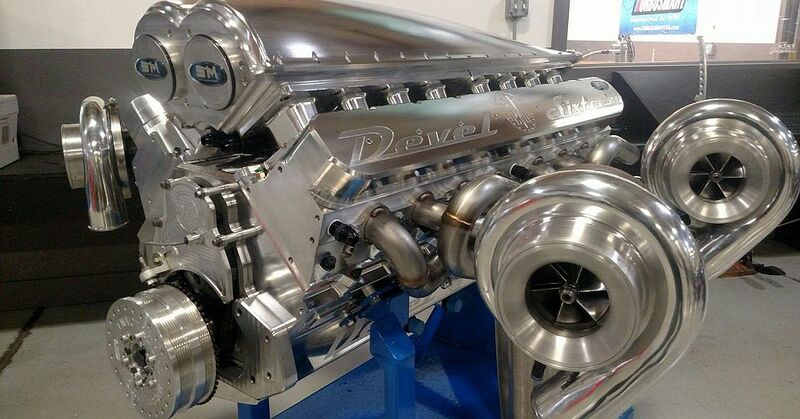 They had to make the engine to rev in order to save the crank from overloading for those desirable 5000 hp. In the end the engine is making just about 5000 horsepower at its redline of 6900 RPM. You can find more info and photos at Steve Morris engines facebook page. Dubai surely knows how to make high performance luxury cars ! Up to this day the Devel Sixteen will cost you a whopping $1M (£620,000) and three clients already have it. If the hyper-car’s power figures were to be even half of those shown, then the Devel Sixteen would appear to be pretty good value for money.